Have you ever heard of Escape Rooms? Although it sounds like something to be frightened of, they've been all the rage in Europe for years, and are gaining popularity in our country at a rapid pace. So, what is an Escape Room? Do you really get locked in? Is it scary? Is it difficult? What if you don't escape? Relax, people, I've got you covered! 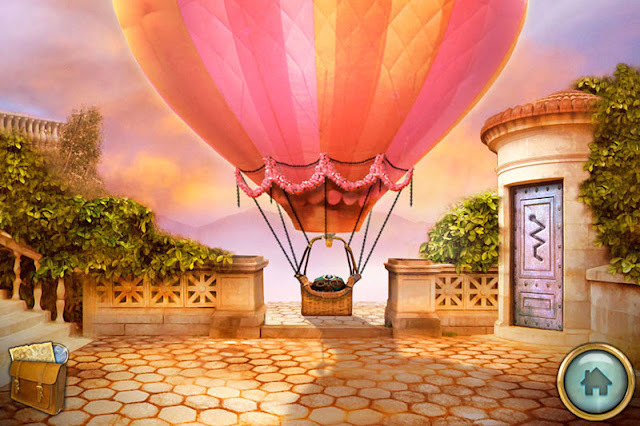 Come with me as I visit The Other Tales Escape Rooms in Hawthorne, New Jersey, a family-friendly adventure room that is sure to leave you smiling. I'll do my best to explain the concept of escape rooms and The Other Tales without giving too much away (no spoilers, I swear!). An escape room is a gaming experience where you join forces with friends, co-workers, family, even strangers (if you wish), to solve puzzles and riddles to reach an ultimate goal. In most experiences, you are trying to get out of a locked room, which might not sound all that fun, but bear with me on this. You usually have a game host who helps you along the way with hints and advice as needed (the game host usually watches through cameras and will give you advice over a speaker). When you participate with a group, you find that each of you brings your own expertise to the table. The Jersey Momma's Boy and I have played escape room-type games on his tablet for years. The apps from Fire Maple Games are our absolute favorite, including The Secret of Grisly Manor, Return to Grisly Manor, The Lost City, and The Hidden World. If you have a child at home who loves riddles and puzzles, try playing one of these with them (with them, I said- two brains are better than one!). The Other Tales is not frightening or scary, and contains no horror images or skulls. It is completely family-friendly. No one jumps out and grabs you - there is nothing haunted! Geez. You are not locked in. Unlike most escape rooms, you are free to leave the room if you need to, but know that the clock is always ticking and that is not recommended. The Jersey Grammy also thought we were going to be in a room in someone's house. That's not the case either and is kind of weird, actually. I loved the concept of The Other Tales because it is really more of an adventure room instead of an escape room. You are not locked in a room and you can leave and go to the bathroom if you need to. So that takes the immediate pressure off of people who are scared of being locked in a room. 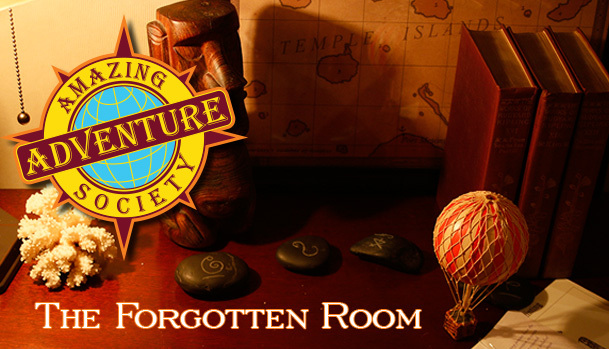 Your goal is to find a 'strange artifact' in a 'forgotten room' of The Amazing Adventure Society headquarters. There is a whole story behind your adventure that you can read about here. And I must say, I had my doubts that this could really come to life in little Hawthorne, New Jersey, but I assure you, it did! The Other Tales Escape Rooms doesn't look like much from the outside. It is located on the second floor of a two-story office building, and you'll pass a regular old bank and some other offices on your way up the stairs. The Jersey Momma's Boy did not agree that it wasn't exciting on the outside, and was even thrilled by the simple waiting room (and the blinds) as we gathered before our game. To each his own! Alex, our game host, met us in the waiting room and explained how the game worked and what to expect. His instructions were very clear and the idea of the game seemed pretty basic even to a simple gal like me. There were seven of us, and our group consisted of two kids (the game is recommended for ages 10 and up. The Jersey Momma's Boy is almost 9, but he plays these types of games all the time so I thought he'd be fine with it and he was), two mommas, and three engineers. I thought we had a good chance of finding the artifact with those engineers on our side. Alex also told us something that might intimidate some of you: 'Googling won't help you here.' Ha! Take that, millennials! Alex did a wonderful job of explaining the back-story to us and telling us about the forgotten room that was recently discovered in the Adventure Society Headquarters. He opened the door for us and we all said, "oooo!" because it was filled with interesting things. And no, I'm not going to tell you what they are because that would ruin everything. So we had 60 minutes to search the room for the hidden artifact. Alex retreated to 'the library' to 'do research' for us, and closed the door behind him (it's not locked!). There were little cameras and speakers in the room so he could watch what we were doing and chime in when we needed a little guidance. That's basically it! All we had to do was explore and take note of what we found; and use what we found to help us find more things that would eventually lead us to the artifact (we hoped). Sometimes we found things that helped us with other tasks. There were locked chests and drawers and many other nooks and crannies to explore. The windows were covered with a faux-stained glass, so it helped to shut out the 'real world' and immerse us in the task at hand. How Difficult is The Other Tales Escape Rooms? Honestly, I thought I wasn't going to bring much to the table. I was worried that I wouldn't be able to solve half the puzzles and that I'd just be following everyone around. But that wasn't the case at all. Everyone seemed to help in their own way. The kids were great at finding things in the room or noticing things that we didn't. If there was something I couldn't figure out, there was someone in our group who could, and vice versa. It was definitely a team effort and I was pleasantly surprised at how everyone jumped into the task at hand and seemed as excited as me to find the artifact. So in answer to the question above, it's just challenging enough! Like Alex had told us, they wanted the experience to be challenging, but fun. It's not fun to be stuck or confused and frustrated. The hints he gave us were just enough of a push without giving anything away. Who is The Other Tales Escape Room For? The Other Tales is recommended for ages ten and up (the puzzles can be a bit complicated, so that is where the age factor comes in). But I think this whole experience is fun for families, friends, birthday parties, corporate team building, dates, you name it! Our group found the artifact in almost record time! I think it was about 45 minutes. Everyone agreed that it was a lot of fun and a nice way to spend the afternoon. The Other Tales Escape Rooms currently has one adventure room (The Forgotten Room) but they are hoping to open another room in the Spring, so stay tuned! How Do I Book an Experience at The Other Tales? You can easily book an experience at The Other Tales through their website. Plenty of dates and times are available to choose from. A room can accommodate up to ten people, but I think our group of 7 was the perfect number. I, personally, think booking the whole room for a private game is the best way to do it, and then splitting the cost between your members. The price varies based on the number of players (the price goes down per player the more players you have, which is comparable to most escape rooms in the area). Booking the whole room for one group is one flat fee. Please visit The Other Tales booking page for more information. If you have any other questions about The Other Tales, check out their FAQ page, which seems to cover just about everything! or follow them on Facebook for updates and promo codes!